Pens are a great way for people to remember you. Whether you choose a personalized click pen, or the old-fashioned stick pen, these pens are at great prices, making this an economical way to advertise. 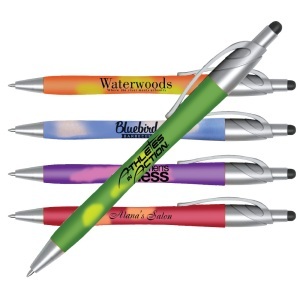 Custom printed pens make your advertising idea perfect. These are American printed writing instruments. You can also purchase them blank. 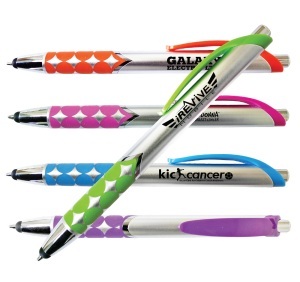 All pens can be personalized for gifts, personal parties, business & other promotional use. These standard pens come in many different colors. 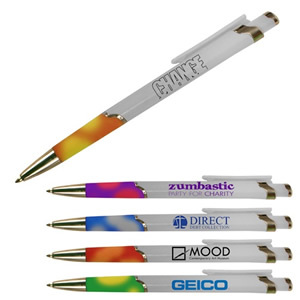 99% of our U.S. population have seen a promotional personalized pen. 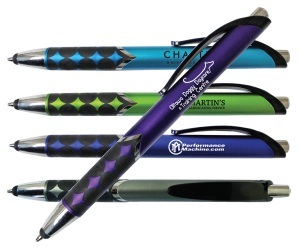 We are happy to be one of the major pen printing companies to bring promotional pens to your church or business. You can imprint with text and with logos or other artwork, in black, white, red, lt. blue, medium blue, dark blue, lt. green, medium green, dark green, brown, purple, yellow, teal, maroon, orange, gold, or silver. 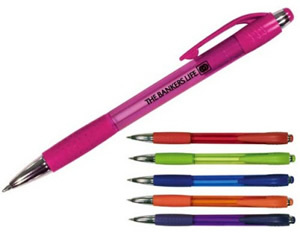 Some pens are available for full-color custom imprint. Contact us for pricing. Click pen with stylus tip has chrome accents. Pen tip extends through stylus tip. Rubber circle pattern on grip. Stylus pen colors are lime green, orange, pink or purple. Medium point ink cartridge available with black ink only. Colored barrel pen has rubber circle pattern on grip. Pen tip extends through stylus tip. Click pen has chrome accents. Stylus pen colors are purple, light blue or gun metal. Medium point ink cartridge available with black ink only. This pen has chrome accents and colorful rubber grips. Silver barrel with your choice of trim colors in purple, red, lime green, blue, orange or pink. Medium point ink cartridge available with black ink only. 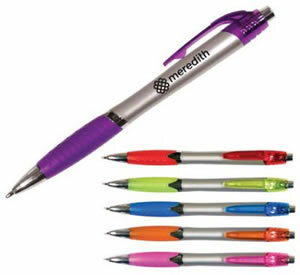 Promotional Stick and Click Pens - Be sure to check out more of our promotional pens. We offer many types and styles of customized pencils too. Check the following pages or give us a call at 706-374-0710 and we will help you select the best pencil for your needs. Free quotes available. Mood Pencils - Pencils that change with the heat of your hand. Jumbo Pencils - Larger pencils for little hands.